Note: Starting with this posting, we will be supplying only JPEG images, rather than the standard GIFs. If your browser, does not support in-line JPEGs, this will not look its best. We suggest using Netscape Navigator to view these pages. Welcome to Arches National Park located just outside of Moab, Utah. This area was used by ancient people, and later by the Anasazi, Fremont and Utes tribes. Here they obtained game, wild plants for food, and stones for tools and weapons. The first explorers came looking for wealth in the form of minerals, and later, ranchers fed their cattle and sheep on the grasses. The park lies atop an underground salt bed. Thousands of feet thick in places, the salt bed was deposited some 300 million years ago when a sea flowed into the region and evaporated over time. This happened many times. The salt was covered over with the residue from floods and winds and the other oceans that came and went. Over millions of years the debris was compressed into rock. This overlying layer may have been more than a mile thick. Once the faces of the fins are exposed, erosion begins to act here too. In the winter, water turns to ice putting pressure on the surrounding rock, breaking off bits and pieces. Wind and water attack the standing fins of rock and, in some, the cementing material gives way. Chuncks of rocks tumbled down. Many fins collapse, but some are strong enough to remain standing, becoming the famous arches. 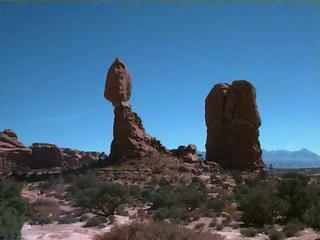 Erosion has created numerous forms like Balancing Rock. The park is named for the more than 2,000 cataloged arches (ranging in size from a 3 foot opening to 306 feet from base to base) that are found here. New arches are continually being formed while others are being destroyed. A section of the park known as the Windows boasts several arches in relatively close proximity. The first is a pair known as the North and South Windows (the left and right arches respectively). Opposite from North and South Windows is the Turret Arch. Click on the thumbnail for the enlarged stereo pair. You can print these and view with a stereo viewer or just try crossing your eyes! This arch started as a cave where a large pothole at the top was continually being dug deeper and deeper by rainwater. 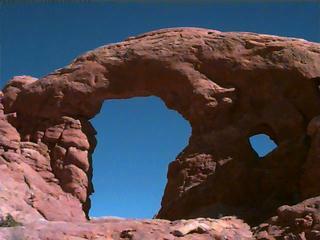 Eventually the pothole wore through and created the large pothole-arch known as Double Arch. Hiking in the blazing sunlight can often cause one to have strange visions. 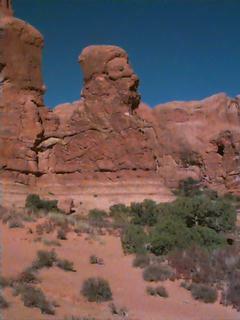 On the hike to Double Arch we noticed a stone pinnacle that seemingly comes from the Wizard of Oz - the Cowardly Lion. Ending our adventures for the day we stopped to view a magnificent wall in the light of the setting sun. The silhouette of the stone wall on the right of the picture reminded early explorers of the famous city street for which the wall is now known, Park Avenue. Click on the thumbnail for the enlarged version. Today we started late (hey... we're on vacation!) 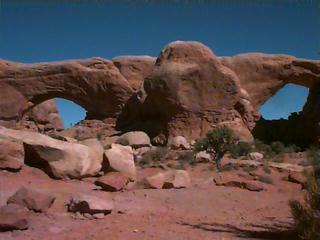 and our first trek took us to Landscape Arch. This is the longest span arch in the park and will probably be the next to collapse. As you can see in the stereo pair, the arch is very open and thin. This year a couple 20-foot sized chunks fell off the arch. 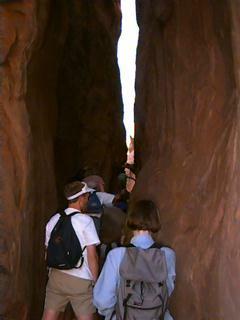 After this short hike, we arrived for our guided hike into Fiery Furnace. This is a set of fins that forms a labarinth. There is no marked trail and reservations are necessary as the group has only 25 people maximum. 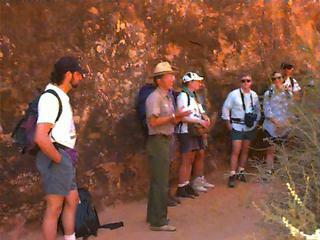 The hike was lead by ranger Andy Nettell. The hike was very interesting and challenging. We walked on narrow ledges, up steep rocks, and had to squeeze through some very tight spaces as you can see. This was a three hour hike and by the time we were done with it, our day was complete.